There is a long affinity between Irish republicans and the Basque people. Each year, large numbers of Basque activists travel to Ireland to meet republican activists and to discuss the situation here and in the Basque country. I have been there several times. In June 2006 I witnessed the huge sense of excitement and expectation that existed during the period of the Eta cessation. The collapse of the cessation in December 2006 after only nine months was a huge disappointment. Since then there have been behind-the-scenes efforts to restore the opportunity and hope that the cessation had created. I and other senior Sinn Fein activists have engaged in an ongoing dialogue with Batasuna - the Basque political party which was banned seven years ago by the Spanish state because of its support for Eta - and others in an effort to help create new momentum in the stalled Basque peace process. Rufino Etxeberria is a leader of Batasuna. He is currently out on bail. In recent months he has been engaged in a lengthy dialogue which I understand involved up to 7,000 activists. This is a remarkable achievement. It concluded last weekend in a conference of the Abertzale Left Regional Assemblies, which includes Batasuna. The conference agreed a new strategy for progress. The impact of the peace process in Ireland is clearly evident in the language used. The resolution, Stand up for Euskal Herria, commits Abertzale Left to using “exclusively political and democratic means” to advance its objectives. It seeks to advance political change “in a complete absence of violence and without interference” and “conducted in accordance with the Mitchell principles”. 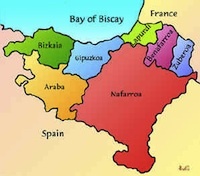 Its goal is to achieve a “stable and lasting peace in the Basque country”. In an interview on Sunday in the Basque language paper, Berria, this new strategy was explained by Etxeberria. He said: “We consider that the process has to be done without violence, which means of course that it will have to happen without any armed activity by Eta.” He reaffirmed that the new political strategy seeks to advance Basque goals “without armed actions by Eta, and without violence or interference by the Spanish state”. This is an important development that creates an opportunity for an end to conflict in the Basque country and for real political progress. It is also evidence of a determination on the part of Abertzale Left to resolve the conflict. The political conclusions to emerge out of the weekend conference are an even more important and significant development. The next steps are crucial in terms of the strategies Abertzale Left develops and the response of the Spanish state. Lessons need to be learned from the 2006 period. Dialogue is urgently required. All sides must be prepared to take risks. This is always very difficult. The Basque separatist groups have spent a lot of time internally agreeing a new way forward. The Socialist government of Jose Luis Rodriguez Zapatero now needs to demonstrate a willingness to examine closely the language, strategy and direction being taken by Abertzale Left - and to respond positively. The US, the EU and others helped the Irish peace process. There is also an important role for the international community in encouraging a resurgent peace process. Sinn Fein will promote conflict resolution and assist in whatever way we can the emergence of a viable and effective peace process. There is a real opportunity for a fundamental change in the relationship between the Basque country and the Spanish state. There is an onus on everyone to grasp this in good faith and to make every effort to bring an end to conflict in that region.